NBC Sports’ Super Bowl live stream problems: Delays, commercials ruin online telecast. 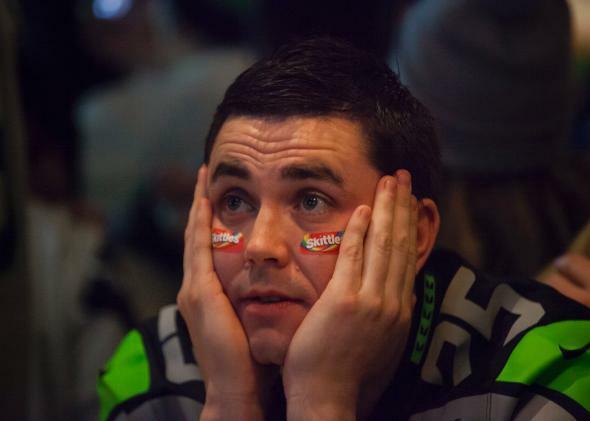 Seahawks fans weren’t the only ones staring at their screens in frustration and disbelief Sunday night. Before the Super Bowl on Sunday, I wrote a post extolling NBC’s decision to live-stream the whole thing for free, including the pregame, halftime, and postgame shows, without requiring a cable subscription. By the numbers, the network’s online offering was a hit. According to CNN’s Brian Stelter, it reached a peak of 1.3 million simultaneous viewers at the time of Malcolm Butler’s game-saving interception. As the game unfolded, however, my enthusiasm turned to exasperation. Judging from my Twitter feed and conversations with others who watched online, I wasn’t the only one who ended up fervently wishing I hadn’t relied on my Internet connection to follow the big game. For those with a TV but no cable, a digital antenna would have been a superior option. And those with neither might have been better off heading to a friend’s house, or a bar, or just about anywhere other than in front of their computer screens. The biggest and most widely reported problem with NBC’s live stream on Sunday was that it lagged consistently behind the telecast. To be fair, whenever you’re streaming a game online, your results will vary with the quality of your Internet connection. But during the Super Bowl, without exception, everyone I talked to who watched the NBC version online complained of a significant lag. That has not always been the case with other big live events I’ve watched online. And I heard it far less from the smaller number of Verizon subscribers who watched the game on its exclusive NFL Mobile app. It was only the NBC Sports Live Extra viewers who were left behind. I take it back. Already shaky glitches in the #SuperBowl live stream. Is it just me? How did everyone know their live streams were trailing the action? For those who follow Twitter on a second screen while watching TV, it became painfully obvious early on that their feeds were full of spoilers. “Touchdown!”, Twitter would shout, while on the screen Tom Brady threw a routine incompletion near midfield. But you didn’t have to be on a second screen to have the game ruined for you by people watching the broadcast on TV. Throughout the game, the neighbors in the apartment above me would go nuts a good two minutes before anything exciting happened on my screen. Eventually it became clear they were rooting for the Patriots. So when Seattle was in the middle of its dramatic final drive and the neighbors let out a series of big whoops followed by an extended cheer, I knew that the Patriots had stopped them and won. I’m told this Super Bowl was among the most exciting in history. But for me and others who watched online, the suspense was ruined. @WillOremus yes; no. But having to stay off Twitter and hearing neighbors yell 30s before I saw every big play was a strange experience. The most maddening part was that, even if you stayed off Twitter and were lucky not to have neighbors within earshot, you still would have had to contend with spoilers from NBC itself. For unfathomable reasons, the NBC Sports Live Extra website maintained a scoreboard widget at the top of the screen that stayed live even when the stream fell far behind. It is hard to overstate just how thoughtless and stupid this was on NBC’s part. @WillOremus & the "live" stream is delayed a couple minutes, except for the redundant score at the top of the screen, which is live. The network did offer an option to “go live” when you fell behind in the screen, skipping you forward until you were only a few seconds behind the action. But every time I tried this, I missed key plays. Worse, on multiple occasions, I found myself jarringly vaulted backward in time shortly thereafter. Obnoxiously, this happened on the crucial interception that ended the Seahawks’ last drive. Just as the ball was picked off, my online stream jumped back some five minutes without warning, to the point where Marshawn Lynch was catching a pass back in the Seahawks’ own territory. My choices were to “go live” again and risk missing the end of the game, or to watch the entire drive for a second time. The second big problem with the live stream was the commercials. As is common in the online streaming business, NBC sold its online ads separately from the ones that ran alongside the broadcast. Some of its broadcast advertisers bought the online spots as well, but many didn’t. For any other event, that would be but a minor annoyance. Usually you aren’t watching TV for the commercials, and you don’t care if a live stream fills the commercial breaks with dead air. The Super Bowl is the sole exception: For many viewers, the ads are a big part of the experience. I don’t blame NBC for selling its online ads separately. It costs money to stream a game over the Web, and the network wants to recoup its investment by charging extra for advertisers to reach the online audience. As it turned out, however, NBC filled the holes in its commercial breaks by running the same terrible ads again and again—and again, and again, and again. To be fair, NBC was dealing with huge traffic for its Super Bowl stream. Streaming a live event to a massive audience without glitches is notoriously difficult. Just ask Apple and Microsoft, both of which have recently seen their live streams fail in the middle of major product announcements. But live coverage of events is NBC’s core business. And of course the network must have been known in advance that traffic would be tremendous. It is the Super Bowl, after all, and cord-cutting has become far more common since the Peacock last aired the big game in 2012. NBC #SuperBowl livestreamed is very choppy. (On 50mbps). Almost like they'd prefer you to watch on a TV. If Sunday’s “streaming event” was meant to be an advertisement for the quality of NBC’s TV Everywhere services, I suspect its effect on most viewers was the opposite of what the network intended. If, on the other hand, NBC’s live stream of the Super Bowl was an elaborate trick to punish cord-cutters, I’d say it was a great success.